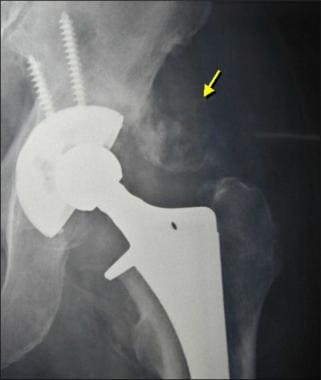 Image from a patient who had a normal, hybrid-type total hip arthroplasty. This anteroposterior radiograph shows the femoral (metal, cemented) and acetabular (polyethylene cup with metal backing, cementless) components. Image from a patient who had a normal total hip arthroplasty. This frog-leg radiograph shows the femoral (metal, press fit, cementless) and acetabular (polyethylene cup with metal backing, screw fixation) components. Image from a patient who had a normal total hip arthroplasty. This frog-leg radiograph shows the femoral (metal, cemented) and the acetabular (polyethylene, cemented [yellow arrow]) components. Image from a patient who had a normal total hip arthroplasty. 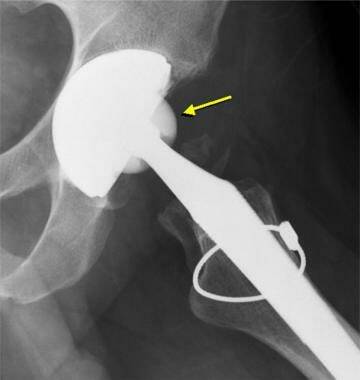 This anteroposterior radiograph shows the femoral (ceramic head [yellow arrow], metal stem, cementless, porous) and acetabular (polyethylene cup, metal backing, cementless, porous) components. Note the extensive reaming that is deep to the acetabular cup, creating a lucency of the rim fit of the acetabular component. Image from a patient who had a normal total hip arthroplasty. This frog-leg radiograph shows the femoral (metal head and stem, cemented) and acetabular (metal, cementless) components. 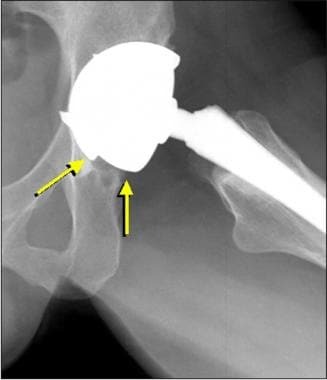 Note the large metal femoral head articulating with the metal acetabular cup (arrows). Image from a patient who had a normal total hip arthroplasty. This frog-leg radiograph shows the femoral (ceramic head [arrow], metal stem, cementless, cable) and acetabular (ceramic cup, metal backing, cementless) components. Note the density of the ceramic head, which is less dense than metal. Image from a patient who had a normal total hip arthroplasty. This coronal computed tomography reformatted image shows the femoral (ceramic head [right yellow arrow], metal stem, cementless, cable) and acetabular (ceramic cup [top yellow arrow], metal backing, cementless) components. Image from a patient who had a normal resurfacing total hip arthroplasty. This anteroposterior radiograph shows the femoral (metal head and stem) and acetabulum components (metal, cementless). Note the large femoral head and the preserved femoral neck. Image from a patient who had a normal unipolar hemiarthroplasty. This anteroposterior radiograph shows the femoral component (metal, cementless) and the normal, native acetabulum. Image from a patient who had a normal unipolar hemiarthroplasty (same patient as in the previous image). This frog-leg radiograph shows the femoral component of the unipolar hemiarthroplasty (metal, cementless). 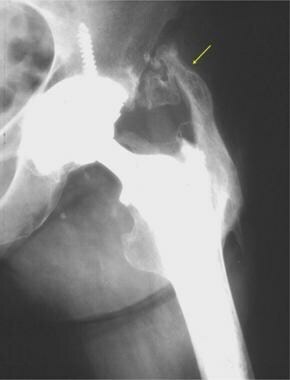 Note the normal sclerotic bone of the acetabulum (which indicates no surgical reaming) and the normal lucent hyaline cartilage between the acetabulum and the femoral head (arrow). Image from a patient who had a normal bipolar hemiarthroplasty. This anteroposterior radiograph shows the femoral (metal head and stem, cemented) and acetabular components (polyethylene cup, metal backing). Note the normal appearance of the acetabulum without reaming (arrow) and the lucency between the acetabulum and cup, which represents the normal acetabular articular cartilage. Image from a patient who had a normal bipolar hemiarthroplasty. This anteroposterior radiograph shows the femoral (metal head and stem, cemented) and acetabular components (polyethylene cup, metal backing). Note the angle between the edge of the acetabular cup and the horizontal. Image from a patient who had a resurfacing hemiarthroplasty. This frog-leg radiograph shows a displaced osseous femoral neck fracture (arrows) adjacent to the hip arthroplasty. The hip joint may be replaced with a variety of materials, including metal, polyethylene, and ceramic. There are also various methods of arthroplasty fixation, including cemented, cementless, and hybrid fixation using a cemented femoral component and a cementless acetabular component. Cement fixation typically uses polymethylmethacrylate (PMMA) with or without cement restrictors or plugs distal to the femoral stem tip. These plugs/restrictors seal the marrow space and increase fixation of the femoral component. Cementless component geometry and the surface are aimed at obtaining optimal initial fixation and allowing for secondary fixation through bony ongrowth or ingrowth and must take into account the variable femur anatomy (see the image below). Axial CT of a cementless femoral stem tip with spline and flute modification. Variable geometry of cementless femoral stems to accommodate for variable femur morphology, including a curved anatomic stem and a double-wedge stem. 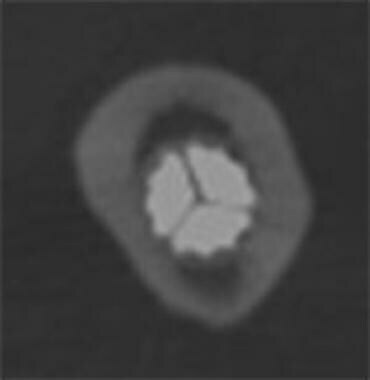 Axial CT of a cementless femoral stem tip with slot modification. 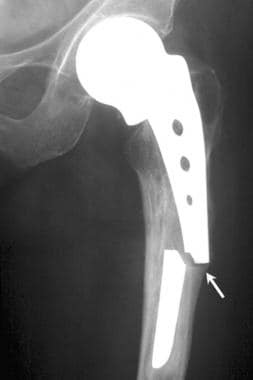 Cables or wires may be used after a trochanteric osteotomy or after a total hip arthroplasty revision (see the image below). Image from a patient who had a normal total hip arthroplasty. This frog-leg radiograph shows cables (arrow) at the site of a trochanteric osteotomy. Follow-up of the asymptomatic patient 9 1 1 1 1 CT without IV contrast can be considered in late follow-up. US can be used as a screening test for metal-on-metal prostheses. Evaluating painful primary total hip arthroplasty and infection has not been excluded. 9 5 5 3 4 X-rays are complementatry to other studies. Aspiration of the hip is the best test for excluding infection. In-111 WBC and Tc-99m sulfur colloid scan is considered the best imaging test for identifying infection. Evaluating painful primary total hip arthroplasty with suspect aseptic loosening (infection excluded). 9 5 3 n/r 5 An image-guided anesthetic injection of the hip with positive results usually indicates an articular cause for pain. Evaluating suspected particle disease (aggressive granulomatous disease, infection excluded). 9 8 7 n/r 3 X-rays are complementatry to other studies. MRI without IV contrast is an alternative to CT. MRI with IV contrast may be appropriate. CT = computed tomography; MRI = magnetic resonance i maging; US = ultrasound. For patient education information, see the Arthritis Center and Foot, Ankle, Knee, and Hip Center, as well as Total Hip Replacement. 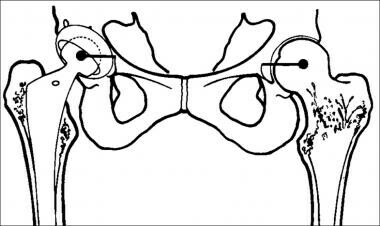 Illustration of the lateral inclination of an acetabular component (adapted from Manaster BJ. Radiographics. 1996;16(3):648.). The angle between the rim of the acetabular cup and the ischial tuberosities should normally be from 30-50º. 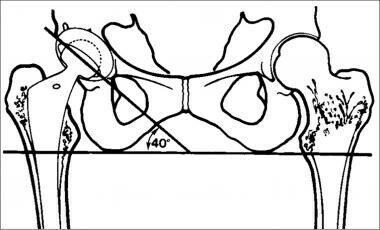 Illustration of an anteversion of an acetabular component (adapted from Manaster BJ. Radiographics. 1996;16(3):649.). Normal anteversion of the acetabular cup is 5-25º on a lateral hip radiograph. Image from a patient who had a normal total hip arthroplasty. This true lateral radiograph shows the normal degree of acetabular component anteversion (dashed line). Courtesy of Dr JC Hodge, New York. Illustration of the vertical assessment of a femoral component (adapted from Manaster BJ. Radiographics. 1996;16(3):648.). The distance from the center of each femoral head to the lines that intersect the ischial tuberosities (between lines A and C) and to the greater trochanters (between lines B and C) should be symmetric. Illustration of the horizontal assessment of a femoral component (adapted from Manaster BJ. Radiographics. 1996;16(3):648.). A line drawn from the center of each femoral head to the adjacent acetabular tear drop (which represents the acetabular margin of the medial hip joint space) should be symmetric. Postoperative measurements can also be performed on CT with multiplanar reformats. Image from a patient who had a cemented total hip arthroplasty. This anteroposterior radiograph shows a &lt; 2 mm-thick normal periprosthetic lucency (arrow) at the bone-cement interface, which is demarcated by a thin, sclerotic line (ie, demarcation line). A lucency at the metal-cement interface of a cemented arthroplasty is typically related to surgical technique. 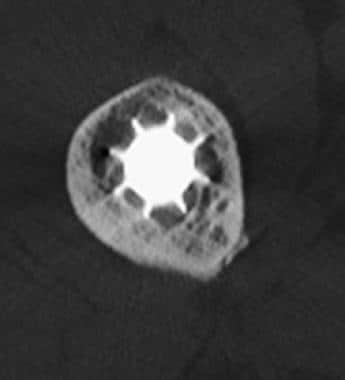 Cementless femoral components may have a linear lucency along the polished segments of a component where bone ingrowth/ongrowth is not expected (see the image below). 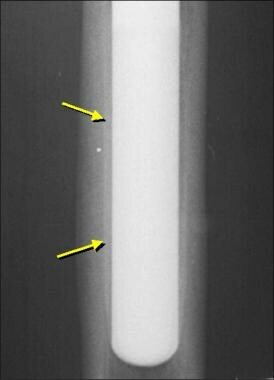 Linear lucency with sclerotic border (arrow) along the polished segment of a distal femoral stem. These lucencies are normal if they are stable over time, but they generally should be less than 2 mm thick (see the image below). Lucencies should be followed up on radiographs because progression can indicate loosening. Image from a patient who had a cemented total hip arthroplasty. The lucency about the femoral stem is demarcated by a sclerotic line (arrows) that measures &lt; 2 mm thick. The lucency was stable over time. Another normal finding at porous ingrowth surfaces is the presence of focal sclerosis or spot welds, which are endosteal new bone formation in contact with the ongrowth/ingrowth surface in cementless components. 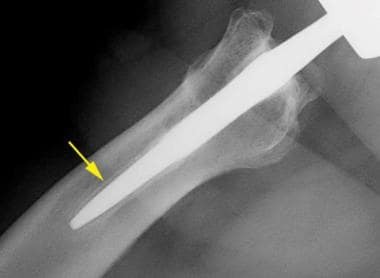 The load taken up by the femoral implant results in reduction and redistribution of periprosthetic bone loading, which may lead to bone resorption referred to as stress shielding, as well as bone hypertrophy (see the image below). Cortical hypertrophy at the metaphyseal-diaphyseal area along a cementless stem in a stable component. 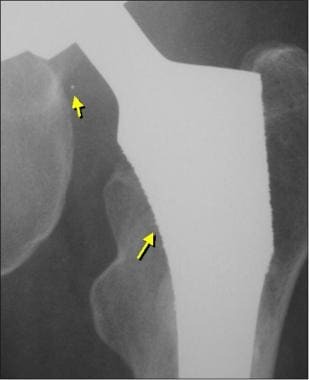 Bone resorption may be seen beneath the femoral flange with a cementless femoral component and with a cemented femoral component, in which a lucency may be up to 4 mm thick (see the second image below). 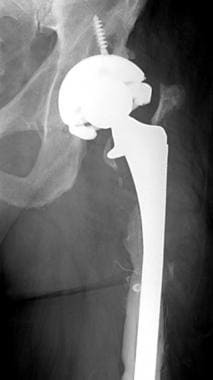 Image from a patient who had a normal total hip arthroplasty. This anteroposterior radiograph shows "spot welds" (arrows) that indicate bone ingrowth at the cementless femoral stem. 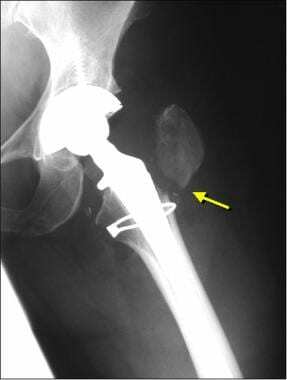 Image from an asymptomatic patient who had bone resorption under the femoral flange (arrow) that measured 4 mm thick. 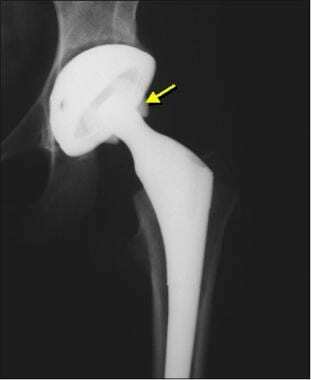 Focal osteopenia of the trochanteric regions due to stress shielding (diverted stress causes bone resorption) is considered a normal finding when the femoral component is secure (see the images below). Image from a patient who had a cemented total hip arthroplasty and stress shielding. 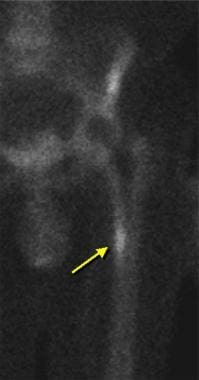 This anteroposterior radiograph shows localized osteopenia (arrow) of the greater trochanter as a result of diverted mechanical stress from the secure arthroplasty. Image of a patient who had a cemented total hip arthroplasty and stress shielding. 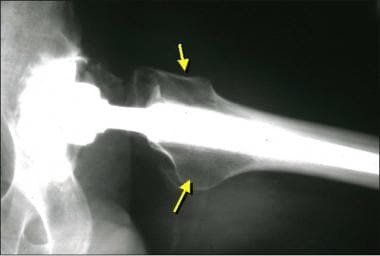 This frog-leg radiograph shows focal osteopenia involving both the lesser and greater trochanteric regions (arrows) as a result of diverted stress. Image of pedestal formation from a patient who had a cementless total hip arthroplasty. This radiograph of the distal femoral stem shows an adjacent sclerosis. Image from a patient who had a normal total hip arthroplasty. This anteroposterior radiograph shows the cement restrictor or centralizer (arrow) distal to the cemented femoral stem. 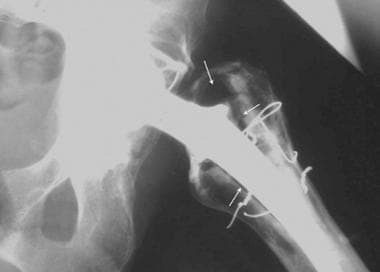 Wire fractures occur in up to 33% of hips and are usually insignificant without greater trochanteric displacement. However, fractured wires may cause an adjacent soft-tissue abnormality such as bursitis. A patient with more than 2 cm of trochanteric displacement may need a repeat operation. The normal radiographic findings described above can also be applied to other imaging modalities, such as CT scanning and MRI. Early complications include improper component placement, dislocation, and cement extrusion. 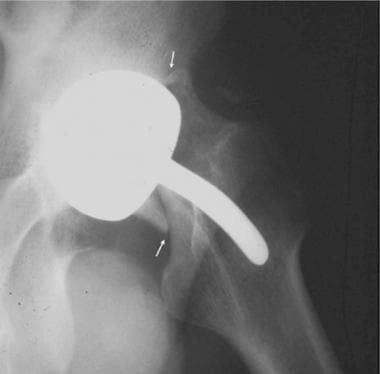 Increased acetabular cup inclination and abnormal version—as well as a femoral component that is too long (causing muscle spasm)—may predispose the hip to a dislocation between the acetabulum and the femoral head (see the image below). Image from a patient who had a cementless total hip arthroplasty. This anteroposterior radiograph shows an acute posterosuperior dislocation of the femoral head from the acetabulum. Most such dislocations occur in the immediate postoperative period. Clinically significant subsidence (>5 mm) in cementless components may occur in the early postoperative period and is often due to technical errors during surgery (see images below). Femoral component position in an initial postoperative radiograph. Significant subsidence of a femoral component 16 days following surgery. 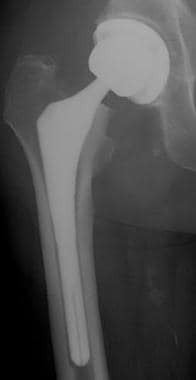 Fractures are more common with the cementless technique. Fractures may occur in the intraoperative setting (see the image below), in the early postoperative setting, or as a late complication. 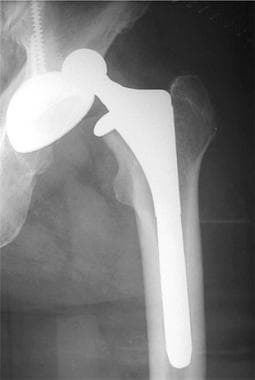 Wedge-shaped femoral stem with intraoperative fracture. Varus angulation between the femoral stem and femoral diaphysis predisposes to femoral fracture at the femoral stem tip (see the first image below). 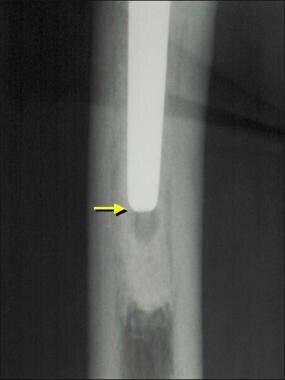 Cement extrusion is typically asymptomatic (see the second image below). Image from a patient who had a cementless bipolar hemiarthroplasty. This anteroposterior radiograph shows a varus angulation between the femoral stem and the femoral shaft (black line) that predisposed the bone to stress and fracture at the lateral femoral cortex (arrow). Image from a patient who had a cemented total hip arthroplasty. 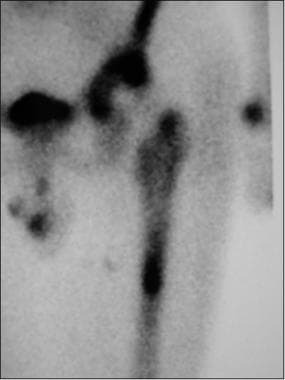 This frog-leg radiograph shows medial extrusion (arrow) of polymethylmethacrylate (PMMA) cement. Late complications include dislocation, hardware failure, fracture, heterotopic ossification, prosthetic loosening, infection, particle disease, and metal-on-metal (MOM) disease. 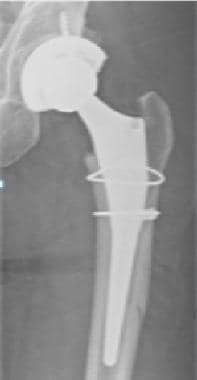 Image from a patient who had a prosthesis failure from a cemented unipolar hemiarthroplasty. This anteroposterior radiograph shows a femoral stem fracture (arrow). 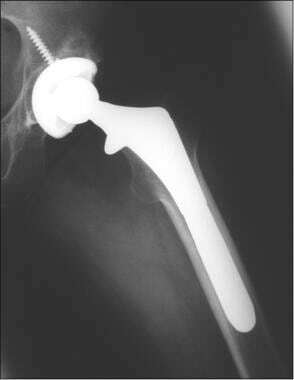 Image from a patient who had a prosthesis failure from a total hip arthroplasty. 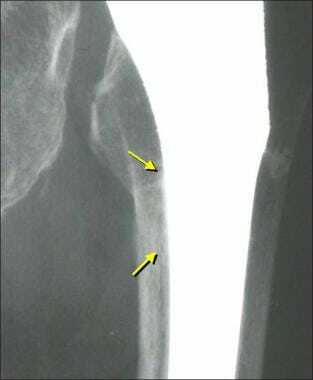 This anteroposterior radiograph shows a fractured and displaced ceramic femoral head (arrow). The femoral neck is in direct contact with the superolateral aspect of the polyethylene acetabular liner. Note the fracture of an acetabular screw and the ceramic fragments within the joint. Image from a patient who had a prosthesis failure from a total hip arthroplasty. This frog-leg radiograph shows the fragmented and displaced acetabular component. 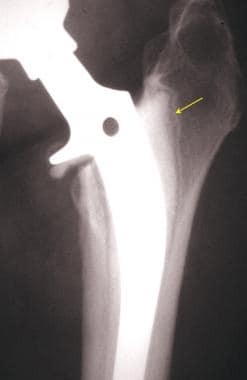 The lucent polyethylene liner has rotated and appears as an oval lucency that projects over the femoral neck (open arrow), whereas the associated metal ring (arrow) is disrupted and displaced. 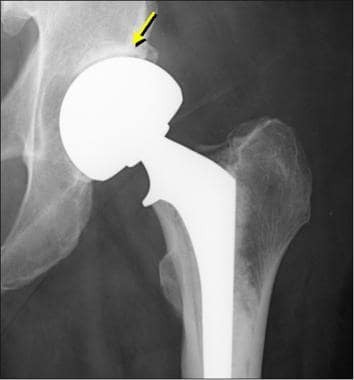 The femoral head is protruding into the native acetabulum. Image from a patient who had a prosthesis failure from a total hip arthroplasty. This frog-leg radiograph shows a displaced greater trochanteric fracture (arrow). 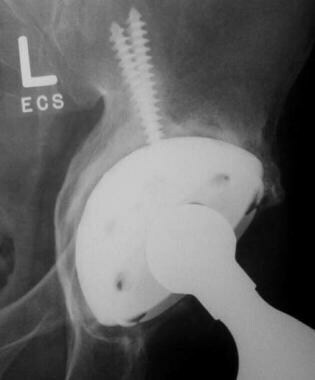 Image from a patient who had a total hip arthroplasty. 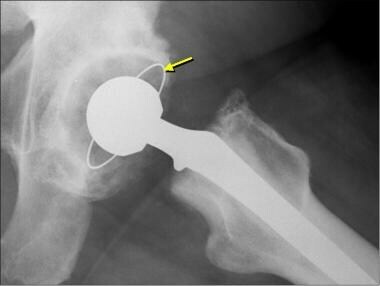 This anteroposterior radiograph shows an acetabular fracture (arrow). Note the abnormal anteversion and lateral rotation of the acetabular component. Image from a patient who had a total hip arthroplasty. This axial computed tomography scan shows an acetabular fracture (arrow). Heterotopic ossification is usually asymptomatic, but it is seen in up to 39% of total hip arthroplasties  and may begin by 2-3 weeks after surgery, with possible ankylosis by 12 weeks (see the images below). Image from a patient who had a total hip arthroplasty. This anteroposterior radiograph shows an ill-defined and nonbridging early heterotopic ossification. Image from a patient who had a total hip arthroplasty. This anteroposterior radiograph shows a well-defined, late heterotopic ossification (arrow) with continuous cortical bone and visualized trabeculae. 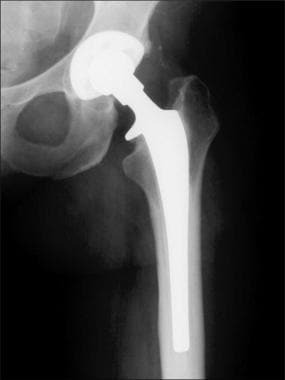 Image from a patient who had a cemented total hip arthroplasty with femoral subsidence. This anteroposterior radiograph shows an abnormal lucency (arrow) distal to the femoral stem. 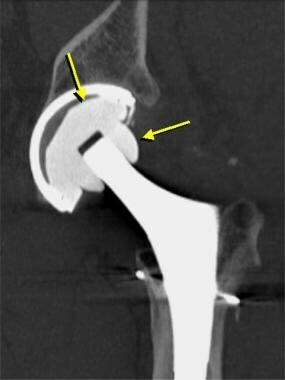 Image from a patient who had a cemented total hip arthroplasty with abnormal prosthesis motion. This anteroposterior radiograph shows the cemented acetabular cup has rotated medially, resulting in an abnormal surrounding lucency, which indicates loosening. The femoral head is in contact with the ilium. 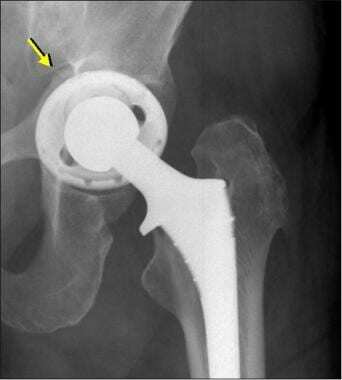 Image from a patient who had a cemented total hip arthroplasty with abnormal prosthesis motion. This anteroposterior radiograph shows abnormal lucencies at the metal-cement and cement-bone interfaces of the acetabular component and the presence of acetabular protrusion. Follow-up image from a patient who had a cemented total hip arthroplasty with abnormal prosthesis motion (same patient as in the previous image). 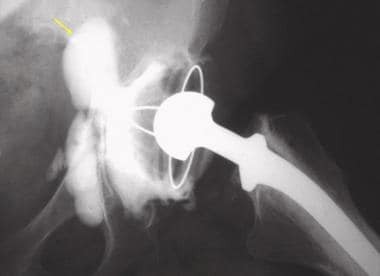 This anteroposterior radiograph shows an interval vertical rotation of the acetabular cup and shows fracture of the acetabular screws indicating component loosening. Image from a patient who had a cemented total hip arthroplasty. 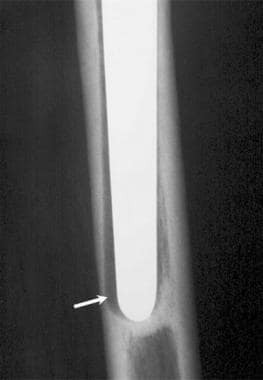 This frog-leg radiograph shows a fracture of the cement (arrow) distal to the femoral stem. Note the angulation of the femoral diaphysis, which is related to abnormal stress and has an increased risk of fracture. 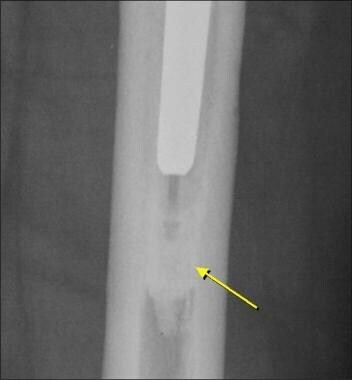 With a cementless component, a femoral component subsidence that is >10 mm or an increased number of metal beads that are displaced from the surface of a bone ingrowth prosthesis over time (bead shedding) also indicates abnormal component motion and loosening (see the image below). Image from a patient who had a cementless total hip arthroplasty. 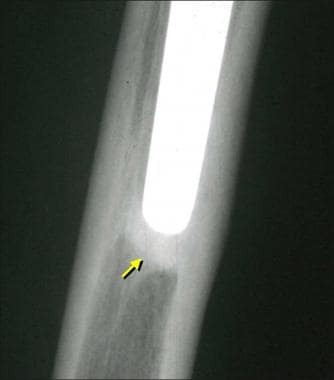 This anteroposterior radiograph shows bead shedding (top, small arrow) from the porous ingrowth surface of the femoral component (bottom, large arrow). A finding that is concerning for loosening in all types of component fixation is a >2 mm or progressive periprosthetic lucency (see the images below), although this may be due to coexisting infection or particle disease. Image from a patient who had a cemented total hip arthroplasty with a subsequent loose femoral component. This anteroposterior radiograph shows a >2 mm lucency at the metal-cement interface (arrows). Image from a patient who had a cementless total hip arthroplasty with a subsequent loose femoral component. This anteroposterior radiograph shows a >2 mm lucency (arrow) around the femoral stem due to an abnormal distal toggling motion. Note the presence of sclerosis at the femoral stem tip, which is termed pedestal formation. The location of periprosthetic lucencies can be described by their zones, which are based on anteroposterior and lateral hip radiographs. On an anteroposterior radiograph, the femoral zones are numbered 1-7, and the acetabular zones are referred to as I, II, and III (see the first image below). 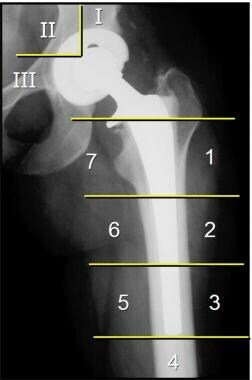 On a lateral hip radiograph, additional femoral zones are numbered from 8-14 (see the second image below). This anteroposterior radiograph shows the numbered femoral and acetabular zones that are used to describe the location of a periprosthetic lucency. This lateral hip radiograph shows the additional numbered femoral zones that are used to describe the location of a periprosthetic lucency. Image from a patient who had an infection following a cemented total hip arthroplasty. 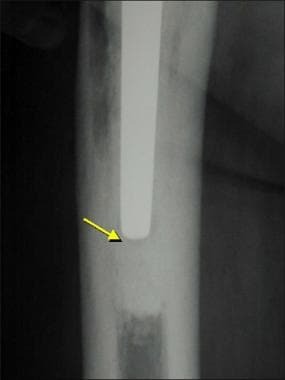 This frog-leg radiograph shows an abnormal lucency (arrows) at the cement-prosthesis interface. Image from a patient who had particle disease following a bipolar hemiarthroplasty. This anteroposterior radiograph shows an abnormal lucency (arrows) that surrounds the acetabular component. Note the asymmetric position of the femoral head (blue dashed circle), which indicates the underlying polyethylene wear of the acetabular component. Image from a patient who had particle disease following a bipolar hemiarthroplasty (same patient as in the previous image). 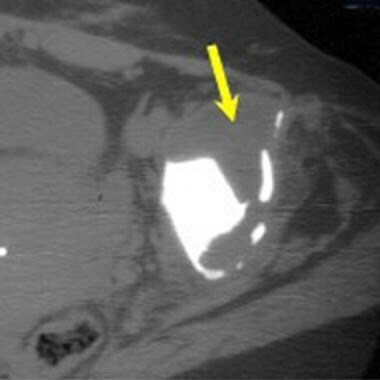 This axial computed tomography scan (without intravenous contrast) shows destruction of the acetabulum (arrow). The bone has been replaced with soft tissue from aggressive granulomatosis. However, a diffuse lucency suggests mechanical loosening or infection; multifocal lucencies can suggest particle disease or infection. 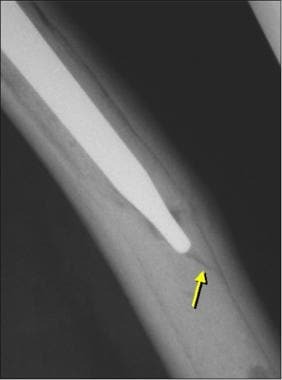 With mechanical loosening, a diffuse lucency around the femoral component can be seen with a pistoning effect (see the first image below), or focal lucencies may be seen at the proximal and/or distal aspects from a toggling effect (see the second image below). 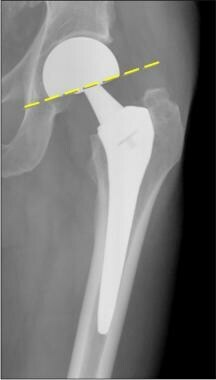 Follow-up image from a patient who had a cemented total hip arthroplasty with femoral subsidence. 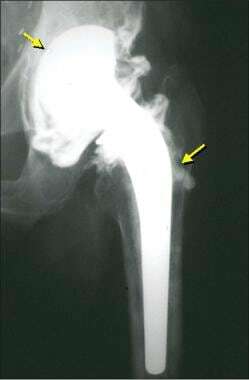 This anteroposterior radiograph shows an interval subsidence of the femoral component (arrow). 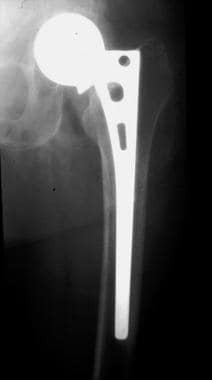 Image from a patient who had a bipolar hemiarthroplasty with a subsequent loose femoral component. This anteroposterior radiograph shows a >2 mm lucency at the proximal femoral component (open arrow), which indicates loosening. 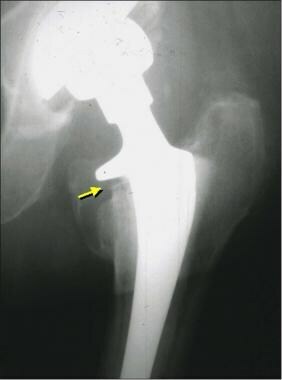 Note the normal native acetabulum (arrow); the adjacent lucency between the acetabulum and the acetabular cup represents the acetabular hyaline cartilage, which is characteristic of a bipolar hemiarthroplasty. Slight superomedial narrowing between the acetabular cup and the native acetabulum indicates cartilage thinning. Evidence for polyethylene wear, which appears as an asymmetric position of the femoral head within the acetabular cup, is an important finding that also suggests particle disease. 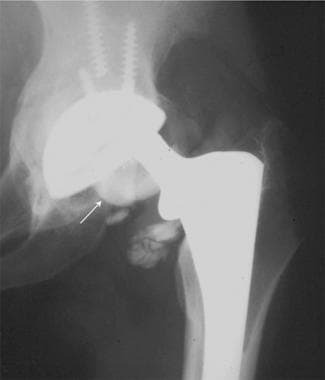 None of the above radiographic findings are specific for infection, and a normal-appearing radiograph does not exclude infection  ; therefore, hip aspiration/lavage is indicated when excluding infection from the differential diagnosis. Imaging is used in symptomatic hip prosthesis and as a screening tool in the asymptomatic prosthesis for exclusion of infection and aseptic loosening as a cause of symptoms, assessment of component positioning, and identification of solid or fluid-filled pseudotumors. 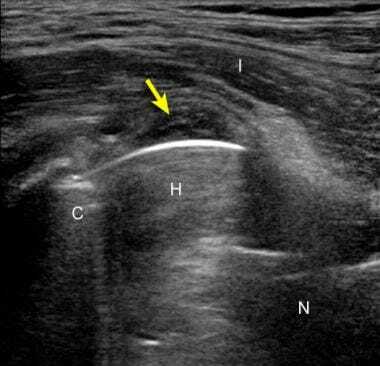 In the context of MOM-related adverse reactions, radiographs are used for assessment of hardware positioning and for identifying periprosthetic osseous erosions, although in some cases the pseudotumors can be identified as a periprosthetic soft-tissue prominence (see the image below). 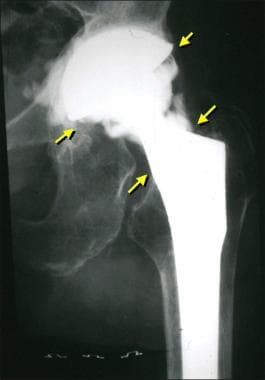 Anteroposterior radiograph depicts a metal-on-metal left hip prosthesis with a periprosthetic soft tissue prominence (arrows). A total hip arthroplasty may undergo revision following complications such as infection, symptomatic loosening, and foreign particle disease. 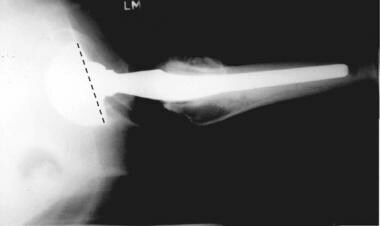 In revision, longer femoral stems may be needed in order to bypass proximal bone defects (see the image below). Long stem revision bypassing proximal femoral defect. Arthrography is primarily used to document intra-articular needle placement during fluoroscopic arthrocentesis to exclude infection. Dedicated arthrography can also be performed to evaluate prosthetic loosening. Normally, intra-articular contrast medium extends from the rim of the acetabular cup to the intertrochanteric line (see the first image below); thus, intra-articular contrast extension at the bone-cement interface can indicate component loosening (see the second image below). However, lack of abnormal contrast extension does not exclude component loosening. Arthrography has also been shown to be unreliable in the evaluation of a noncemented hip arthroplasty. Hip arthrogram from a patient who had a total hip arthroplasty. This anteroposterior radiograph (after intra-articular injection of iodinated contrast medium) shows filling of the joint from the acetabular rim to the intertrochanteric line (arrows). The opacity that is seen around the acetabular component is cement. 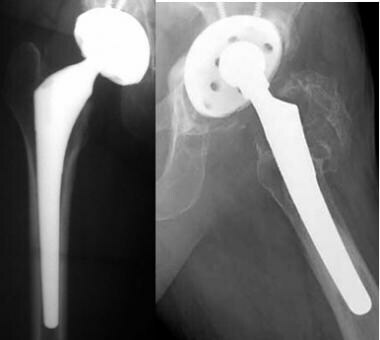 Image from a patient who had a cemented total hip arthroplasty with subsequent loosening of the prosthesis. This anteroposterior radiograph (after intra-articular administration of iodinated contrast medium) shows abnormal contrast extension deep to the acetabular cup and beyond the intertrochanteric line (arrows) at the bone-cement interface. Image of the femoral component from a patient who had a cemented total hip arthroplasty. This anteroposterior radiograph (after intra-articular iodinated contrast injection) shows extension of intra-articular contrast medium into the iliopsoas bursa (arrow). 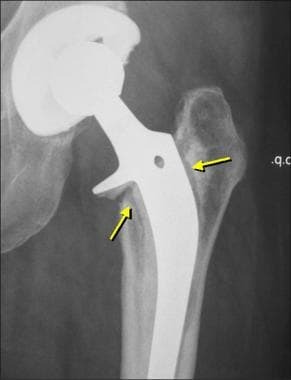 Image of the femoral component from a patient who had a cemented total hip arthroplasty (same patient as in the previous image). This lateral radiograph shows intra-articular contrast medium filling the iliopsoas bursa (arrow) anterior to the hip joint. Image from a patient who had a cemented total hip arthroplasty. This anteroposterior radiograph (after intra-articular iodinated contrast injection) shows filling of an irregular trochanteric bursa (arrow). 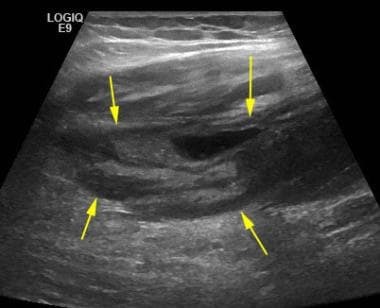 Ultrasonography should be considered before the performance of a fluoroscopic aspiration of a hip joint in order to exclude infection and to screen for any adjacent and overlying soft-tissue abscesses; needle placement at fluoroscopy could theoretically be passed through an unsuspected soft-tissue abscess, thus contaminating a sterile joint. As a standard imaging method for evaluating the clinical outcomes of an arthroplasty procedure, radiography can clearly show the shape and location of the metal implant and the periprosthetic bone status and is reliable in the diagnosis of a dislocation, an osseous fracture, and hardware failure. Because abnormal lucencies around a prosthesis that are caused by an infection may appear similar to that which is seen with prosthetic loosening or particle disease, arthrocentesis is typically used to exclude a diagnosis of infection. Both radiography and arthrography would not detect a soft-tissue infection; thus, a normal-appearing radiograph does not exclude the presence of an infection. Arthrography is not reliable in the evaluation of a noncemented hip arthroplasty. In addition, a normal arthrogram does not exclude the possibility of a loose prosthesis. Although the initial evaluation of a hip arthroplasty should begin with radiography, there is a definite role for CT evaluation in several situations. When there is concern about infection, CT scanning is complementary to radiography in that CT scans can show soft-tissue abscesses (see the image below). 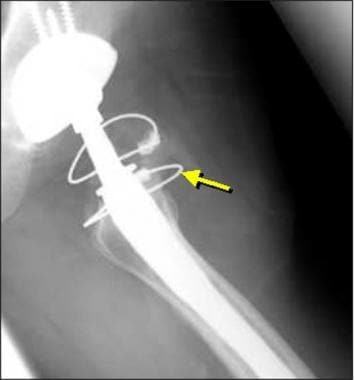 Image of the femoral component from a patient who had a cemented total hip arthroplasty. 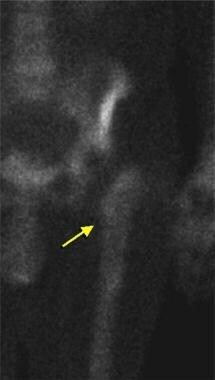 This coronal multiplanar reformatted computed tomography scan shows a soft-tissue abscess (arrow) extending from the distal prosthesis. Note the subsidence of the femoral component. A significant role for CT scanning is in the evaluation of osteolysis that is related to particle disease (see the image below). Although radiography is effective in identifying large, abnormal periprosthetic lucencies, CT scans better characterize and show the extent of the osteolysis. With multiplanar reformation in multiple imaging planes, CT scans also display the location of the osteolysis and assess the status of the adjacent normal bone before surgery. CT may be used in patients with metal-on-metal (MOM) prosthesis to assess component position, identify osseous erosions, or identify periprosthetic solid/cystic pseudotumors. Lastly, CT scans can show the location of fragmented or failed arthroplasty components and periprosthetic fractures (see the image below), as well as assess the acetabular component version. To reduce metal artifacts when imaging a hip prosthesis with CT scanning, it is important to optimize various technical parameters (see the image below). The milliamperes (mAs) are increased (350-450 mAs in adults; up to 600 mAs if there are bilateral hip arthroplasties), but one must also take the radiation dose into consideration, especially if one is imaging children. Additional methods to reduce artifacts include the use of lower pitch settings (to reduce cone beam artifacts with multichannel scanners), narrow detector element collimation, increased peak killivoltage (kVp) (140 kVp), and a smoother image reconstruction algorithm (eg, use of a standard soft-tissue filter vs a bone filter). The original data are reconstructed using 1.0-1.5–mm thick slices with a 50% overlap, and then multiplanar reformations are created using 1.5-2–mm thick slices in the coronal and sagittal planes. 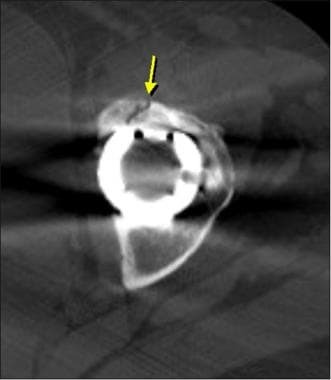 Soft-tissue abnormalities immediately adjacent to a metal prosthesis may not be seen on CT scans because of the presence of artifacts, which can potentially cause a false-negative examination result; however, this depends on the quality of the image and the technician's success in reducing such artifacts. MRI has some limitations because of the metal-induced artifacts produced by the prosthesis that may obscure the adjacent soft tissue and any bone abnormalities. Besides implant material composition, artifact genesis and reduction are influenced by the configuration and location, selection of appropriate MRI hardware, sequences, and parameters. Metal artifact reduction sequences (MARS) are essential for proper radiologic evaluation of postoperative findings in these patients. 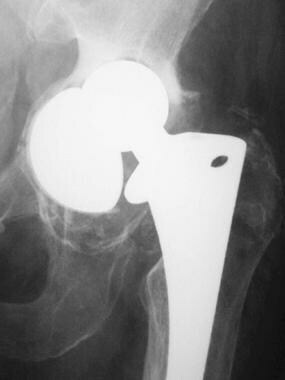 Image from a patient who had a total hip arthroplasty. 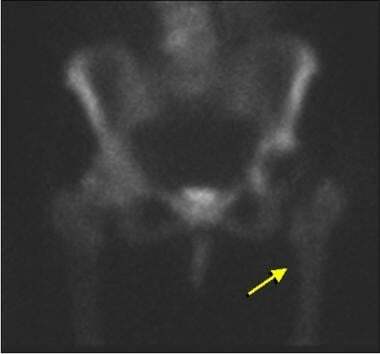 This axial T1-weighted magnetic resonance image shows the distended iliopsoas bursa is isointense relative to muscle (arrow). 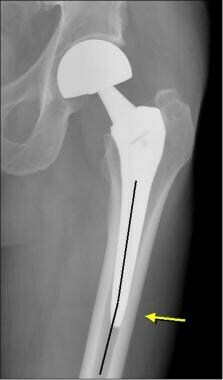 Note the signal void in the femur from the metal prosthesis. 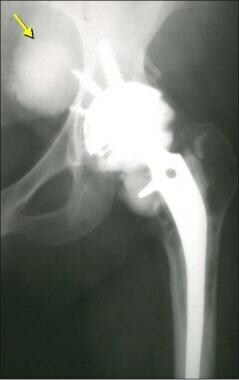 Image from a patient who had a total hip arthroplasty (same patient as in the previous image). 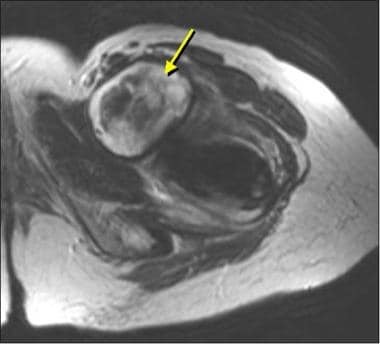 This T2-weighted, fat-saturated, fast-spin-echo magnetic resonance image shows heterogeneous distention of the iliopsoas bursa (arrow). 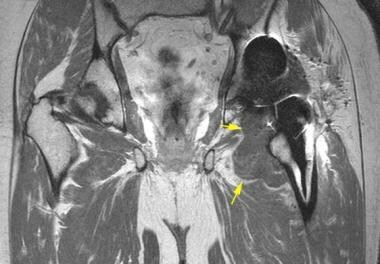 Coronal post contrast T1-weighted MRI depicts a predominantly solid pseudotumor (arrows) along a metal-on-metal total hip prosthesis. Artifacts that are produced by a prosthesis on MRI may obscure any adjacent soft-tissue and bone abnormalities. However, these artifacts can be reduced by optimizing the MRI's technical parameters. Radiography remains an important imaging method to evaluate hip arthroplasty. Unlike CT scanning or MRI, with ultrasonography, the artifacts produced by metal occur deep to the prosthesis; therefore, periprosthetic fluid collections can be visualized with this modality. The plane of the ultrasound beam or the long axis of the transducer is positioned along the long axis of the femoral neck of the prosthesis. Often, a lower frequency transducer is needed to optimize the image resolution (< 10 MHz); a curvilinear transducer or a linear transducer with a trapezoidal function is helpful to increase the field of view. The superficial contours of the arthroplasty and the adjacent acetabulum and femur allow identification, and the metal components will appear hyperechoic with posterior reverberation artifacts (see the image below). The native bone of the acetabulum and femur will also appear hyperechoic but with posterior acoustic shadowing. Image from a patient who had a normal total hip arthroplasty. 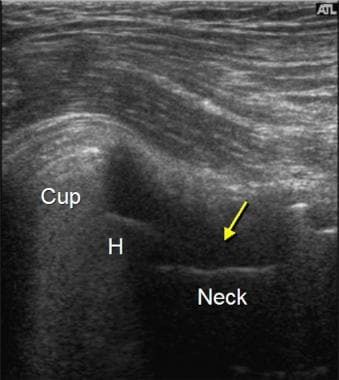 This ultrasonogram is longitudinal to the femoral neck (Neck) and shows the hyperechoic surface (arrows) of the metal femoral head (H) and neck of the prosthesis, as well as posterior reverberation artifacts (between the open arrows). Note the hyperechoicity and shadowing of the native acetabulum (Acet) and the femur. The left side of the image is proximal; the right side is distal. A normal hip arthroplasty may show minimal hypoechoic tissue along the femoral neck component or no tissue at all. Abnormal fluid will appear anechoic or hypoechoic over the femoral neck component (see the images below). Image from a patient who had a bipolar hemiarthroplasty. 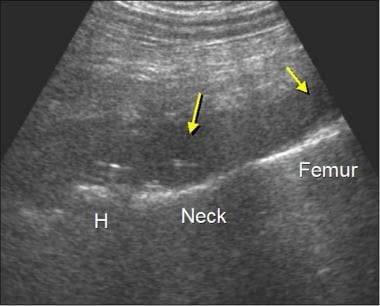 This ultrasonogram is longitudinal to the femoral neck (Neck) and shows a hypoechoic effusion (arrow) that is superficial to the femoral neck. Note the femoral head (H) and acetabular cup (Cup) of the prosthesis. The left side of image is proximal; the right side is distal. 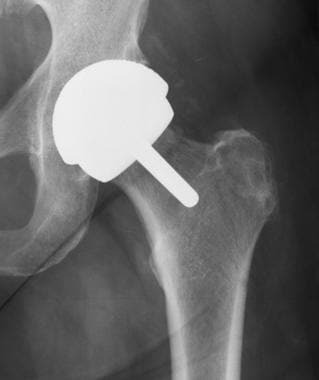 Image from a patient who had a total hip arthroplasty with subsequent joint infection. 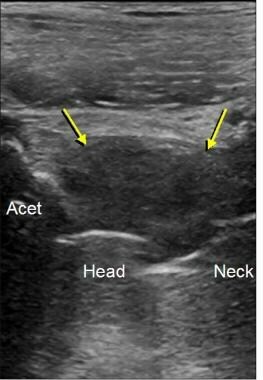 This ultrasonogram is longitudinal to the femoral neck (N) and shows a hypoechoic effusion (arrow) anterior to the femoral neck. Note the acetabular cup (C). The left side of the image is proximal; the right side is distal. 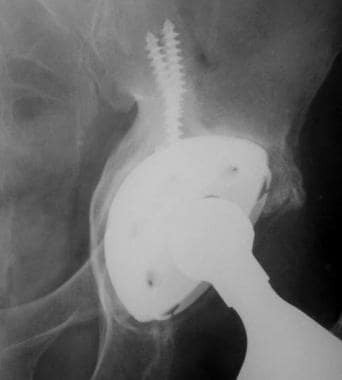 Image from a patient who had a total hip arthroplasty. This ultrasonogram is longitudinal to the femoral neck (Neck) and shows a hypoechoic synovitis (arrows) that is superficial to the head (Head) and neck of the prosthesis. The left side of the image is proximal; the right side is distal. 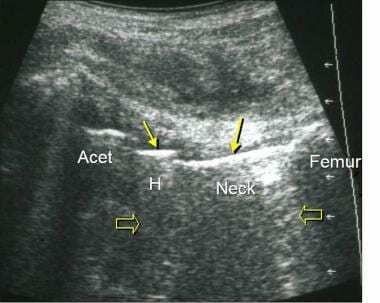 Acet = the native acetabulum. It is important to scan around the entire hip region to adequately assess for the possible presence of a soft-tissue fluid collection or bursae (see the images below); in addition, imaging deep to the skin incision is very important, as fluid collections often occur here. Image from a patient who had a total hip arthroplasty. This ultrasonogram is anterolateral to the hip arthroplasty and shows a hypoechoic and heterogeneous soft-tissue abscess (arrow). Note the increased through-transmission deep to abscess. 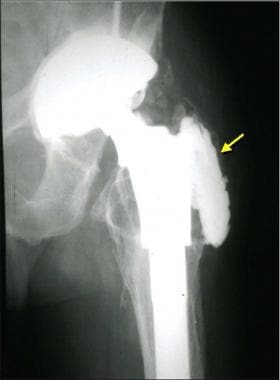 Image from a patient who had total hip arthroplasty with subsequent infection of the endoprosthesis. This coronal ultrasonogram of the left thigh is longitudinal to the femur (Femur) and shows anechoic fluid (arrows) adjacent to the prosthesis (Arthroplasty) and native femur. Note that the posterior reverberation artifacts (between the open arrows) from the metal prosthesis occur away from the transducer and do not obscure the overlying fluid collection. The native femur demonstrates posterior shadowing. 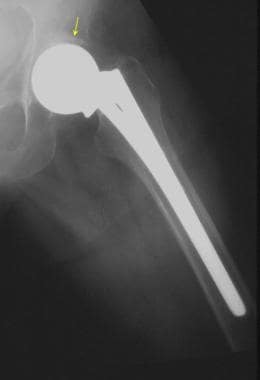 Image from a patient who had a total hip arthroplasty with subsequent infection. This ultrasonogram is longitudinal to the femoral neck (Neck) and shows the presence of hypoechoic infected fluid (arrows) extending beyond the head (H) and neck of the prosthesis over the native femur. The left side of the image is proximal; the right side is distal. 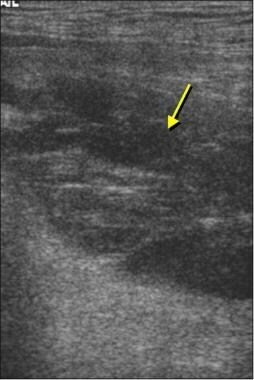 Ultrasonography may be used in conjunction with fluoroscopy in the setting of infection to evaluate for soft-tissue abscesses and other extra-articular fluid collections. It is important to exclude an extra-articular fluid collection before fluoroscopic arthrocentesis, because there is a theoretical risk of seeding a sterile joint by passing a needle through an overlying soft-tissue abscess. Image from a patient who had a total hip arthroplasty with a subsequent thickened iliopsoas bursa. 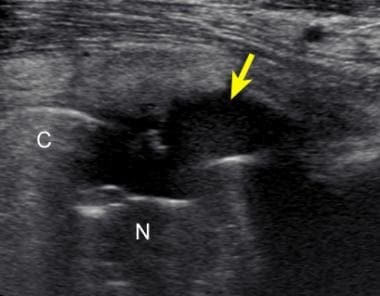 This ultrasonogram is longitudinal to the femoral neck and shows abnormal hypoechoic tissue (arrow) in the region of the iliopsoas bursa between the iliopsoas tendon (I) and femoral head (H) of the prosthesis. Ultrasound-guided anesthetic injection of this tissue relieved the patient's symptoms. C = acetabular cup; N = femoral neck of the prosthesis. The left side of the image is proximal; the right side is distal. In the context of metal-on-metal (MOM) prosthesis, ultrasound may be used to identify periprosthetic solid or cystic pseudotumors, identify injury to surrounding structures such as the gluteal muscle and tendons, and guide aspirations in case of fluid collections or cystic pseudotumors (see the image below). Complex periprosthetic solid and cystic mass (arrows) dissecting through the soft tissues in a symptomatic patient with a metal-on-metal total hip arthroplasty. Another advantage of ultrasonography is the ability to dynamically assess the hip joint and the adjacent structures; this modality can evaluate any snapping or symptomatic condition that requires joint movement or unusual positioning. Significant joint effusions or extra-articular fluid collections can be identified easily with ultrasonography. In a patient with a large body habitus, it may be difficult to visualize or exclude a small joint effusion. In this setting, percutaneous joint aspiration is needed if the clinical suspicion for infection is high, preferably with the use of fluoroscopic guidance so that intra-articular needle placement can be confirmed with an iodinated contrast medium. Nuclear medicine studies have also been used to diagnose prosthetic loosening or infection of hip arthroplasties. 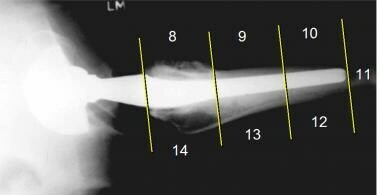 A cemented component may normally demonstrate radionuclide uptake on a bone scan within 1-2 years (see the images below). Bone scan from an asymptomatic patient following a total hip arthroplasty (&lt; 1 y postoperative). 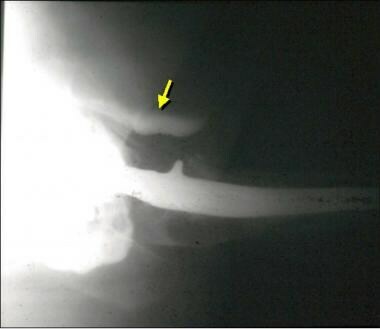 This delayed image shows mild radionuclide uptake (arrow) around the prosthesis. Bone scan from an asymptomatic patient following a total hip arthroplasty (>1 y postoperative). 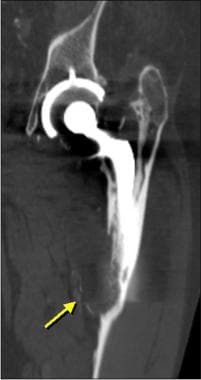 This delayed image shows no significant radionuclide uptake around the femoral prosthesis. Increased tracer uptake after this period can indicate infection, prosthetic loosening (see the first image below), or fracture (see the second image below); the sensitivities range from 50-100%. With a cementless component, increased radionuclide uptake on a bone scan may persist secondary to bone ingrowth. In general, a negative bone scan suggests that infection or component loosening is unlikely. Bone scan from a patient who had a total hip arthroplasty with a subsequent loose component. 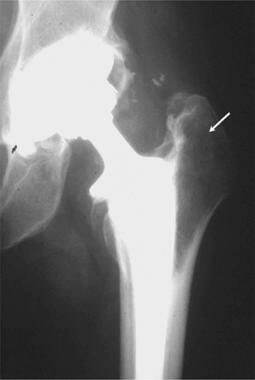 This image shows abnormal tracer uptake at the greater tuberosity, femoral stem, and acetabulum. Bone scan from a patient who had a total hip arthroplasty and a subsequent femoral fracture. 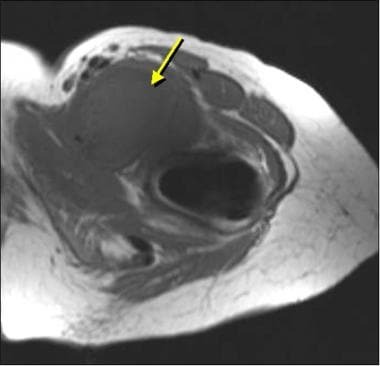 This delayed scan shows focal tracer uptake medial to the femoral stem (arrow). Tracer uptake on a gallium scan that correlates with bone scan findings indicates infection with few false-positive results. Labeled white blood cell scans are more specific than gallium scans, but false-negative results are possible in these cases in the presence of chronic infection. To exclude cellulitis, the radionuclide uptake on labeled white blood cell scans should correspond to the bone scan findings; to exclude normal bone marrow, white blood cell scan uptake should not correspond to sulfur colloid uptake. Correlation with radiographs is important. Percutaneous aspiration is often required to confirm the presence of an infection. Pluot E, Davis ET, Revell M, Davies AM, James SL. Hip arthroplasty. Part 1: prosthesis terminology and classification. Clin Radiol. 2009 Oct. 64(10):954-60. [Medline]. Mulcahy H, Chew FS. 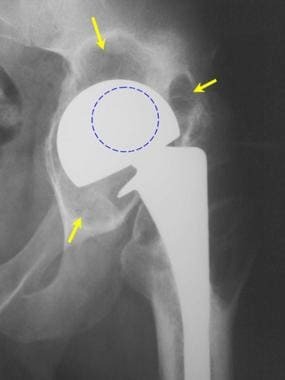 Current concepts of hip arthroplasty for radiologists: part 1, features and radiographic assessment. AJR Am J Roentgenol. 2012 Sep. 199(3):559-69. [Medline]. [Guideline] American College of Radiology. ACR Appropriateness Criteria Imaging After Total Hip Arthroplasty. acsearch.acr.org. Available at https://acsearch.acr.org/docs/3094200/Narrative/. May 2015; Accessed: August 17, 2018. Derias M, Khan MA, Buchanan J. Digital templating without a calibration marker is accurate at predicting implant size for hip hemiarthroplasty. Eur J Trauma Emerg Surg. 2018 Sep 12. [Medline]. Khan AM, Rafferty M, Daurka JS. Hemiarthroplasty compared with total hip arthroplasty in fractured neck of femur: a shift in national practice?. Ann R Coll Surg Engl. 2018 Aug 16. 1-7. [Medline]. Khanuja HS, Vakil JJ, Goddard MS, Mont MA. Cementless femoral fixation in total hip arthroplasty. J Bone Joint Surg Am. 2011 Mar 2. 93(5):500-9. [Medline]. Yamada H, Yoshihara Y, Henmi O, Morita M, Shiromoto Y, Kawano T. Cementless total hip replacement: past, present, and future. J Orthop Sci. 2009 Mar. 14(2):228-41. [Medline]. Gonzalez Della Valle A, Comba F, Taveras N, Salvati EA. The utility and precision of analogue and digital preoperative planning for total hip arthroplasty. Int Orthop. 2008 Jun. 32(3):289-94. [Medline]. [Full Text]. Manaster BJ. From the RSNA refresher courses. Total hip arthroplasty: radiographic evaluation. Radiographics. 1996 May. 16(3):645-60. [Medline]. [Full Text]. Weissman BN. 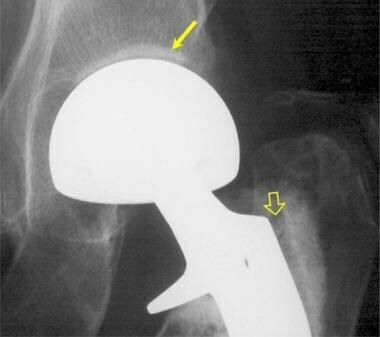 Imaging of total hip replacement. Radiology. 1997 Mar. 202(3):611-23. [Medline]. [Full Text]. Weissman BNW, Sledge CB. The hip. Orthopedic Radiology. Philadelphia, Pa: WB Saunders Co; 1991. 385-495. Einsiedel T, Gebhard F, Bregolato I, et al. Proximal cement fixation in total hip arthroplasty-first results with a new stem design. Int Orthop. 2008 Jun. 32(3):295-306. [Medline]. Tigges S, Stiles RG, Roberson JR. 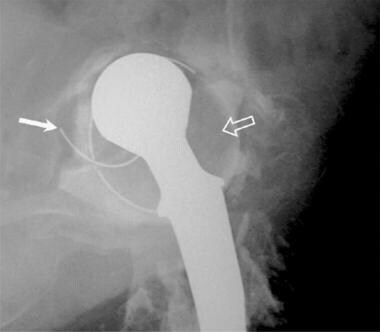 Appearance of septic hip prostheses on plain radiographs. AJR Am J Roentgenol. 1994 Aug. 163(2):377-80. [Medline]. [Full Text]. Daniel J, Holland J, Quigley L, Sprague S, Bhandari M. Pseudotumors associated with total hip arthroplasty. J Bone Joint Surg Am. 2012 Jan 4. 94(1):86-93. [Medline]. Wiley KF, Ding K, Stoner JA, Teague DC, Yousuf KM. Incidence of Pseudotumor and Acute Lymphocytic Vasculitis Associated Lesion (ALVAL) Reactions in Metal-On-Metal Hip Articulations: A Meta-Analysis. J Arthroplasty. 2013 Aug. 28(7):1238-45. [Medline]. van der Weegen W, Sijbesma T, Hoekstra HJ, Brakel K, Pilot P, Nelissen RG. Treatment of Pseudotumors After Metal-on-Metal Hip Resurfacing Based on Magnetic Resonance Imaging, Metal Ion Levels and Symptoms. J Arthroplasty. 2013 Jul 18. [Medline]. Berquist TH, Bender CE, Maus TP, Ward EM, Rand JA. Pseudobursae: a useful finding in patients with painful hip arthroplasty. AJR Am J Roentgenol. 1987 Jan. 148(1):103-6. [Medline]. [Full Text]. Kitamura N, Pappedemos PC, Duffy PR 3rd, et al. The value of anteroposterior pelvic radiographs for evaluating pelvic osteolysis. Clin Orthop Relat Res. 2006 Dec. 453:239-45. [Medline]. Buckwalter KA, Parr JA, Choplin RH, Capello WN. Multichannel CT imaging of orthopedic hardware and implants. Semin Musculoskelet Radiol. 2006 Mar. 10(1):86-97. [Medline]. Talbot BS, Weinberg EP. MR Imaging with Metal-suppression Sequences for Evaluation of Total Joint Arthroplasty. Radiographics. 2016 Jan-Feb. 36 (1):209-25. [Medline]. Ma Y, Zuo P, Nittka M, Cheng X, Shao H, Wang C. Comparisons of slice-encoding metal artifact correction and view-angle tilting magnetic resonance imaging and traditional digital radiography in evaluating chronic hip pain after total hip arthroplasty. J Orthop Translat. 2018 Jan. 12:45-54. [Medline]. [Full Text]. Reito A, Elo P, Puolakka T, Pajamäki J, Nieminen J, Eskelinen A. Repeated magnetic resonance imaging in 154 hips with large-diameter metal-on-metal hip replacement. Acta Orthop. 2014 Dec. 85 (6):570-6. [Medline]. Nikolaou VS, Petit A, Khoury V, Blain-Pare E, Zukor DJ, Huk OL, et al. Magnetic resonance imaging of painful metal-on-metal total hip replacement. Eur J Orthop Surg Traumatol. 2015 Feb. 25 (2):313-9. [Medline]. Wolf M, Bäumer P, Pedro M, Dombert T, Staub F, Heiland S, et al. Sciatic nerve injury related to hip replacement surgery: imaging detection by MR neurography despite susceptibility artifacts. PLoS One. 2014. 9 (2):e89154. [Medline]. Jungmann PM, Agten CA, Pfirrmann CW, Sutter R. Advances in MRI around metal. J Magn Reson Imaging. 2017 Oct. 46 (4):972-991. [Medline]. Hayter CL, Gold SL, Koff MF, Perino G, Nawabi DH, Miller TT. MRI findings in painful metal-on-metal hip arthroplasty. AJR Am J Roentgenol. 2012 Oct. 199(4):884-93. [Medline]. Lohmann CH, Rampal S, Lohrengel M, Singh G. Imaging in peri-prosthetic assessment: an orthopaedic perspective. EFORT Open Rev. 2017 May. 2 (5):117-125. [Medline]. [Full Text]. Weybright PN, Jacobson JA, Murry KH, et al. 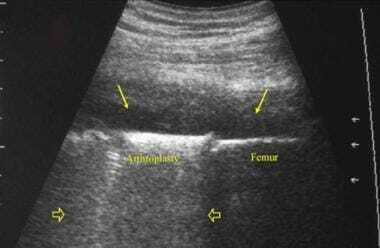 Limited effectiveness of sonography in revealing hip joint effusion: preliminary results in 21 adult patients with native and postoperative hips. AJR Am J Roentgenol. 2003 Jul. 181(1):215-8. [Medline]. [Full Text]. van Holsbeeck MT, Eyler WR, Sherman LS, et al. Detection of infection in loosened hip prostheses: efficacy of sonography. AJR Am J Roentgenol. 1994 Aug. 163(2):381-4. [Medline]. Rezig R, Copercini M, Montet X, Martinoli C, Bianchi S. Ultrasound diagnosis of anterior iliopsoas impingement in total hip replacement. Skeletal Radiol. 2004 Feb. 33(2):112-6. [Medline]. Miller TT. Imaging of hip arthroplasty. Semin Musculoskelet Radiol. 2006 Mar. 10(1):30-46. [Medline]. Reinartz P. FDG-PET in patients with painful hip and knee arthroplasty: technical breakthrough or just more of the same. Q J Nucl Med Mol Imaging. 2009 Mar. 53(1):41-50. [Medline]. Image from a patient who had a normal bipolar hemiarthroplasty. This frog-leg radiograph shows the femoral (metal head and stem, cemented) and acetabular components (polyethylene cup, metal backing). Note the angle between the edge of the acetabular cup and the horizontal. The motion between the acetabular cup and the native acetabulum is normal. Radiograph from a patient with particle disease (aggressive granulomatosis). Note the extensive lucencies around the acetabular component of the hip. The sclerotic line on this radiograph represents normal bone condensation of the acetabulum, whereas the lucency represents the adjacent hyaline cartilage. 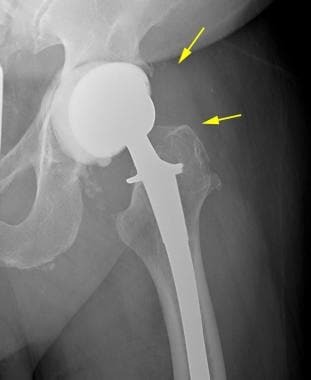 The presence of these findings indicates no surgical alteration of the acetabulum has occurred; therefore, the prosthesis is not a total hip arthroplasty. Disclosure: Received royalty from Elsevier Publishing Company for textbook author; Received consulting fee from BioClinica for consulting. Could Low Birth Weight and Preterm Birth Be Associated With Significant Burden of Hip Osteoarthritis?